The finest performer of Tabla from Ajrara Gharana Ustad Akram Khan received his initial training in music from Late Ustad Niazu Khan who was famous for his technical style and guidance. He is also fortunate to have learnt from his great grand father Ustad Mohd. Shafi Khan. 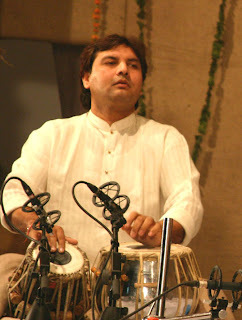 He continues his riyaz and training under the able guidance of his father Ustad Hashmat Ali Khan. He has also undergone formal training at the Prayag Sangeet Samiti, Allahabad and qualified Sangeet Praveen (Master of Music) from there, apart from Sangeet Visharad at Chandigarh. He has a bachelor degree in commerce. He is also a Top Grade artist from All India Radio New Delhi. Akram Khan began performing at music conferences at a very young age. Since then, he has been participating in prestigious festivals across the globe. In 1987, he performed with Ustad Vilayat Khan in Japan and in 1992 he accompanied the maestro to the United States. He has performed before enthralled audiences at the Kennedy Centre and the Lincoln Centre in U.S.A. He was part of the celebrations for the 50 years of India's Independence in India, as well as abroad. CD by Rhyme Records USA titled "Creating Waves" with Shri Shubhendra Rao and Saskia De Haas Rao. Compact Disc "Solo" "Ancestors" released in United States. Compact Disc with Shri Gaurav Mazumdar. Cassettes with Pt. Bhajan Sopori, Budhadidtya Mukherjee produced by 'Music Today'. Cassettes with Ustad Shujaat Khan. Cassettes with Pt. Rajan & Sajan Mishra. Cassettes with Ustad Rashid Khan "Music Today". Cassettes with Smt. Kala Ramnath "Music Today".